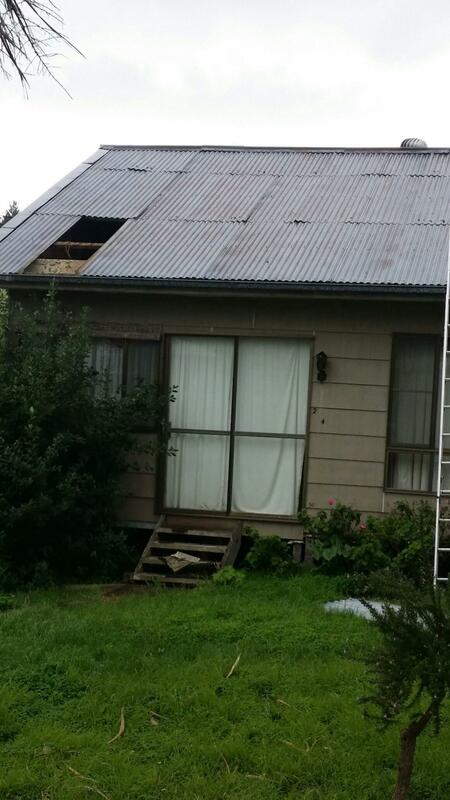 Stormy south east weather has created damage in some areas recently with the SES answering a call yesterday, Tuesday 12th May, to this Mt Burr house which lost roofing iron in the wind. This week is volunteer week and it is a good time to remember all Emergency Services workers who we depend on, including the SES personnel called to this emergency. Categories: Community Groups, General News, Mount Burr | Tags: SES answer storm damage calls. | Permalink. Mt Burr’s Kevin and Aileen Bellman’s son Bradley lives in Manchester England where he works as a train driver. He turned 50 recently. His parent’s Kevin and Aileen were in Adelaide at their son Mark’s house to celebrate Bradley’s birthday which was going to include a skype session with Bradley in Manchester. Aileen just began talking to Bradley’s mate Craig on skype from Manchester. He told Eileen he’d go and get Bradley to talk to her. Kevin and Aileen were unaware that Bradley had decided to come to Australia to surprise them for his 50th birthday and was at brother Mark’s home. A fantastic surprise for the Bellman’s. Best wishes to the Bellman’s from all 5THE FM for lovely time with your family. Categories: General News, Human Interest, Mount Burr | Tags: Bellman family birthday surprise | Permalink. Midwife Anna Wilson and Dr Bushel with new mum-to-be. In light of diminishing services available to pregnant women in the region since the closure of Obstetric Services at the Millicent Hospital mid 2013 by Country Health SA, the Medical Clinic Millicent has picked up the obstetric ball and run with it; launching a new service in the form of a specialised Midwifery Clinic. It will be a Medicare bulk-billed service and will be available on Mondays on a fortnightly basis from the beginning of July this year. Dr Bushell will celebrate 18 years at the Millicent Clinic this year and continues to seek ways to improve obstetric care for patients in the region. Dr Bushell now shares his time between the Medical Clinic, the Millicent Hospital on-call roster and Obstetric Services at the Mt Gambier Hospital since the closure of Obstetric Service’s at the Millicent Hospital doesn’t allow him to deliver in the local hospital. Women still have the option of returning to Millicent Hospital after their delivery for post natal care. Anna is a Registered Nurse of 7 years and Mid-Wife of 4 years. She joined the Medical Clinic 2011, and worked at the Millicent Hospital from 2011 until recently. Anna no longer works at the Millicent Hospital but is a Community Midwife in Bordertown and is now employed by the Medical Clinic Millicent. “The new Midwifery Clinic will offer ante-natal and post-natal care, including general pregnancy education, and breastfeeding support according to the World Health Organisation breastfeeding criteria,” she said. “I think some women like to have a woman to speak to during their pregnancy, as well as their doctor, and I am looking forward to this aspect of patient care too,” said Anna. Anna plans to become an Eligible Midwife and will apply for her Medicare provider number by the end of the year. All Midwives can provide midwifery continuity of care, or to work in private practice. In addition, an Eligible Midwife can order ultrasound scans and some pathology tests that may be required during pregnancy and early parenting, and can refer women and babies directly to medical practitioners. Anna’s additional qualifications will mean increased services available to patients, at the Midwifery Clinic, in the future. Midwife Jill Little’s duties at the Medical Clinic will include supporting Anna in the new Midwifery Clinic. Appointments can be made at Reception at the Medical Clinic Millicent and the service is available to all women needing ante-natal and post natal care and advice. Categories: Beachport, Canunda, Coonawarra, Furner, General News, Glencoe, Hatherleigh, Health, Kalangadoo, Kangaroo Inn, Kingston, Kongorong, Location, Millicent, Mount Burr, Mt Gambier, Nangwarry, Penola, Port MacDonnell, Rendelsham, Robe, Southend, Tantanoola, Wattle Range | Tags: Midwifery Clinic | Permalink.